For those who have no place to go and no one with whom to share their Valentine’s Day, your gift can give hope that they will find their way home. Be a valentine to a neighbor in need. It’s February once again and love is in the air! Valentine’s Day is a special holiday, not because of the abundance of cards, chocolate and flowers, but because it reminds us all to express our appreciation to the ones we love. We, at Father Joe’s Villages, are grateful for our donors and the love you share with the people we serve. It is your love that allows us to keep over 2,100 people off the streets each night and in the safety of our housing programs and it is your love that helps us provide comprehensive services that are tailored to the unique needs of people who are homeless. Your love is especially important to some of our older residents, who have no place to go and no one with whom to share their Valentine’s Day. Take Eugene for example. Eugene is an 89-year-old WWII veteran, who became homeless last year. Until that point, Eugene owned a mobile tire-repair company for over 20 years. His vehicle was central to this business—it was where he both worked and lived. Suddenly, after making a mistake when renewing his vehicle license, Eugene found himself without his livelihood. At this point, Eugene realized that he was too tired to continue the labor-intensive work that had supported him for so long. He needed to retire to a home of his own—not a vehicle parked in an abandoned lot. With nowhere to go and no family able to take him in, Eugene didn’t know what to do. That’s when the San Diego Police Department directed Eugene to Father Joe’s Villages. Eugene was then enrolled into our Transitional Housing Program for Veterans, where he had access to Father Joe’s Villages’ comprehensive services and a safe, warm place to sleep at night. 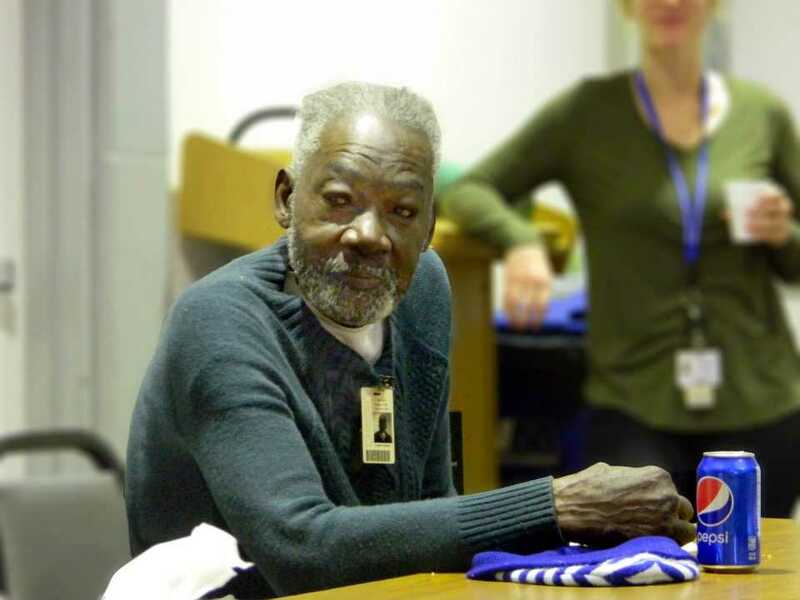 Meanwhile, Eugene’s case manager worked with him to find permanent housing where he could retire in peace. Just recently, Eugene was matched with housing and will finally find his way home after years of hard work and service to his country. When no one else was there, Father Joe’s Villages staff stepped in to offer comfort and security to a veteran in need—but it was our donors who really made this possible. Because of you, an 89-year-old veteran no longer lives on the streets of San Diego. Time and time again, your donations directly impact the lives of our clients—giving them hope and support during difficult times. Because of you, Eugene has received the best Valentine’s Day gift of all: a home. Show your love to seniors like Eugene who have no place to go. Be their valentine and help veterans and seniors overcome homelessness by supporting Father Joe’s Villages for Valentine’s Day. Give today. We thank you for your continued support for the people we serve. Neighbors like Eugene will never truly be alone with valentines like you by their side. P.S. You can also share the love by dedicating a tribute gift to a special someone. We’ll even share their name and your special message on our website! Just give a tribute gift to a loved one in honor of Valentine’s Day. Then, follow the link on the “Thank You” page to share a special message to them.